Heat coals or gas grill for direct heat. Make Lime-Taco Dressing. 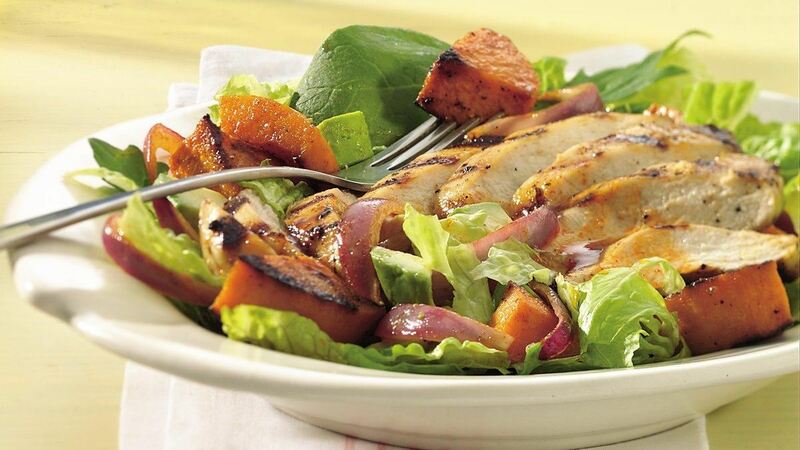 Use about 1/4 cup dressing for grilling; reserve remaining dressing to drizzle on salad. Toss squash and onion with about 2 tablespoons dressing for grilling in large bowl. Place squash and onion in grill basket. Place chicken and grill basket on grill. Cover and grill 4 to 6 inches from medium heat 15 to 20 minutes, turning chicken once and shaking grill basket or stirring vegetables occasionally, until juice of chicken is no longer pink when centers of thickest pieces are cut and vegetables are tender. Brush chicken and vegetables with remaining dressing for grilling during last 5 minutes of grilling. Arrange salad greens on large platter. Top with avocado, squash and onion. Cut each chicken breast into slices; fan over vegetables. Drizzle with reserved dressing. Sprinkle with cilantro.